Last season, former high school and college baseball player, Bryan Hoover, had a goal that thousands around the country only dream about – to play professional baseball. This sounds like a story that is told over and over again, but this one is a little bit different. Hoover is 38 years old and had not played baseball competitively in 19 years. After graduating high school in 1995 and playing at Gordon College in 1996, he gave up baseball at the age of 19 to serve God. For the last 20 years, Hoover has used his musical ability to serve God through ministry work and has also formed and pastored The Avenue Church from 2010 to 2014. In 2014, the desire to play baseball competitively came back to him. He began training, getting in baseball shape, and eating healthier. After a year of hard work and dedication, Hoover, with the support of his wife, Angela, and their three children began traveling the country to various baseball tryouts. During one tryout in Camden, NJ for the Atlantic League’s Riversharks, he impressed a group of fans with his talent and great attitude. One fan in particular, Tom Peculski, turned out to be a huge blessing for Hoover. Although Hoover failed to make the Riversharks roster, it was only the beginning of his friendship with Peculski. “Several days later, Bryan had sent me a friend request on social media. I accepted and began following his travels,” Peculski explained. Finally, Hoover was given a tryout in upstate New York for the newly formed North Country Baseball League (NCBL). Peculski and Hoover jumped in the car and headed to yet another tryout together. Hoover held his own with the Road City Explorers, becoming a leader in the clubhouse and impressing coaches from not only the NCBL, but all around independent baseball. Eddie Gonzalez, manager for the Road City Explorers, had nothing but great things to say about Hoover. “I was blown away by his answer because for 19 years Bryan had not played ball, yet got him self ready to come to a pro tryout and out perform guys that were already on the team, fresh out of college, and with affiliated pro experience. Two weeks after signing, the Explorers promoted Alfredo Patino to York of the Atlantic league which opened a utility spot. I felt he was a perfect fit to jump in that role, and I was confident that Bryan deserved a shot. He proved in a league full of players that went on to play in Atlantic league or American Association, that he could play with the best of them. Now, Hoover is looking ahead to next season. He wants to continue playing professional baseball and move up the indy ball ladder with his family by his side. Getting his story out there and making an impression on coaches in other leagues is certainly a start. One coach that he has had an impact on is Billy Horn, pitching coach for the Can-Am’s Ottawa Champions. “I’ve had the privilege of meeting Bryan at a couple of workouts over the past year and was shocked when I found out he was 38. It’s amazing seeing a guy 10-15 years older than everyone out there and run a 6.81 60 yard dash, have a better arm than most of the guys and swings the bat pretty well also. Gonzalez is also working hard to make that dream of moving up a reality for Hoover. “Bryan will be 39 years old next season, but he has shown in 2015, that he has the talent to be on the same baseball field with any of them. He is right now in better shape physically than many guys in the league. He can be an asset to any team that gives him chance, and a great player in the clubhouse. This winter Bryan also participated in the Florida Indy Ball tryout and he out performed 32 other players there. He received the highest grading by all coaches in attendance. While his future is uncertain, Hoover knows he wants baseball to be a part of it. He has never given up his love for the game, and with his family’s tremendous support, he is ready to take the next step in his professional playing career wherever the road takes him. Left Handed Pitcher Jeff Singer was born in Philadelphia and spent most of his life in New Jersey. He went to Gloucester County College for two years, where he was a 2 time All-American National Champion and National Player of the Year. He then spent a year at Monmouth University, and eventually finished his collegiate career as a Scarlet Raptor at Rutgers University-Camden for his final year. Singer led the Scarlet Raptors’ staff in starts (10), innings (66), strikeouts (69) and saves (2), while tying for the staff lead in appearances (13). As the team’s pitching ace, he compiled a 3.82 ERA and a 4-3 record. Ultimately he went undrafted after college, and when a workout with the Phillies after the draft also didn’t result in a contract, he turned to the Camden Riversharks in the Atlantic League. The Atlantic League is known more as a veteran’s league than a rookie league, and Singer was the youngest pitcher in the league. He knew that he had to use that as an opportunity to learn and grow. “I was very lucky to start my professional career in the Atlantic League. I got the opportunity to play with players that made it to the big leagues, and even some that have World Series rings. It was a big change from Rutgers-Camden to the Atlantic League,” Singer explained. He started the season in the bullpen for the Riversharks, but eventually finished out the season as a starter. Singer was 1-4 with a 5.26 ERA in 13 games (6 starts) with Camden. In 49.2 innings, he allowed 51 hits and walked 30 batters while striking out 30 batters. Singer threw for the Boston Red Sox, New York Yankees and Baltimore Orioles in a workout after the Atlantic League season and was getting some interest, especially from the Yankees. That was when Phillies scout Rowland George, who had been following Singer, suggested that the Phillies take another look and move quickly if they wanted to sign him. 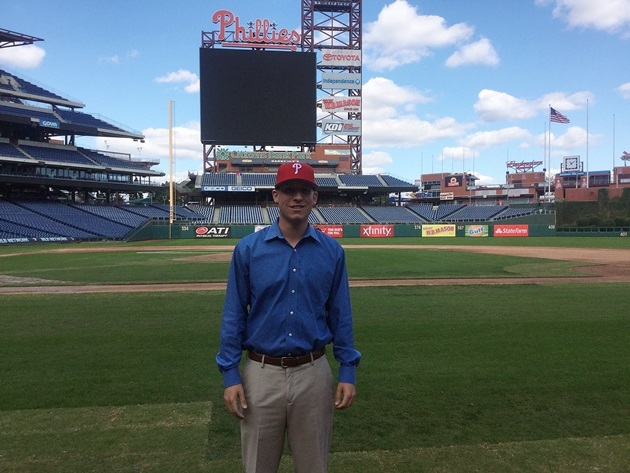 Last month, the lifelong Phillies fan signed a minor league contract with the team. He will get a chance to prove himself to the Phillies in spring training when they will decide what level to start him at and if he will be used as a starter or reliever.